While Middle Eastern pita bread is baked in the oven, the Moroccan equivalent, batbout, is cooked stove top in a skillet or on a griddle. 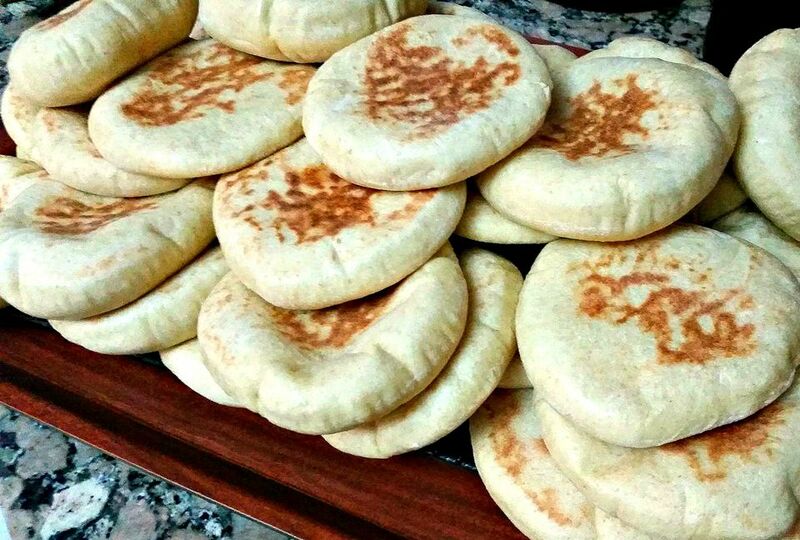 Also known as mkhamer or toghrift or matlou', it features a soft and chewy texture and, if cooked properly, a pita-like pocket that's perfect for making sandwiches of all kinds. This recipe for batbout is made using a blend of white, whole-wheat, and semolina or durum flours. Adjust the ratio of flours to your own preference, but avoid using white flour only as the end result will be gummy. Activate the yeast by combining it with 1/4 cup of the warm water and a teaspoon of the sugar. Set the mixture aside until it's frothy, about 5 to 10 minutes. In a large bowl, combine the flours, remaining sugar, and salt in a mixing bowl. Add the yeast mixture, the oil, and the rest of the water, and mix to form a soft, manageable dough. Knead the dough in a mixer with a dough hook, or by hand on a lightly floured surface, for about 10 minutes or until smooth and elastic. The dough should be quite soft but not sticky. If it's too sticky to work with, add a little flour one tablespoon at a time. If the dough feels a bit stiff, work in additional water one tablespoon at a time. Divide the dough into smooth balls the size of small plums and let them rest, covered, on a lightly floured surface for about 10 minutes. Roll out each ball into a thin circle about 1/8 inch thick. Set the rounds of dough on a clean, dry towel and cover. Leave to rise for about 1 to 1 1/2 hours, until light and puffy. Heat a very lightly oiled cast-iron skillet, griddle or other nonstick pan over medium heat. Allow the pan to get quite hot. Cook the batbout in batches, turning several times, until golden brown on both sides. The browning will be a bit uneven since the bread puffs up as it cooks, but that's okay. Transfer the cooked batbout to a rack or towel-lined basket to cool. It's fine to stack them while they're warm. Batbout will keep fresh for two days at room temperature. They freeze well and can be heated directly from the freezer in a microwave oven just until thawed. Avoid overheating or they will dry out. Traditionally, you might find batbout served with grilled meats, but in Ramadan, batbout are often stuffed with tuna, cooked chicken, or kefta, cold cuts or other fillers. When made thicker and without a pocket, you'll also find batbout dipped in hot syrup made from butter and honey, in the same manner done for msemen or beghrir. Kids will love watching you make batbout because the bread puffs up as it cooks. Note that if the batbout is made thicker, as may be the case when serving with honey, the bread may not puff up. In that case, it still can be used for sandwiches by simply slicing or gently prying open the interior to make a pocket.